必ずSIMをセットしてからSTEP2に進んでください。 ※If you do not set SIM, you may not be able to proceed to APN setting in STEP 2. 利用登録をしなかった場合、SIMカードは無効となります。 ※Please register your user information within 30 days after completing APN settings. 利用期間内は、「IIJmioクーポンカード」「IIJmioクーポンカード/デジタル」でデータ量をリチャージできます。 You can purchase the "IIJmio Coupon Card" "IIJmio Coupon Card/selectable"to add data volume to your package within the period of Service availability. 凡在可使用期间内，即可使用“IIJmio充值卡””IIJmio可选的优惠券卡”再次充值数据量。 You can purchase the "IIJmio Coupon Card" "IIJmio Coupon Card/selectable"to add data volume to your package within the period of Service availability. You can purchase the "IIJmio Coupon Card" "IIJmio Coupon Card/selectable"to add data volume to your package within the period of Service availability. You can purchase the "IIJmio Coupon Card" "IIJmio Coupon Card/selectable"to add data volume to your package within the period of Service availability. 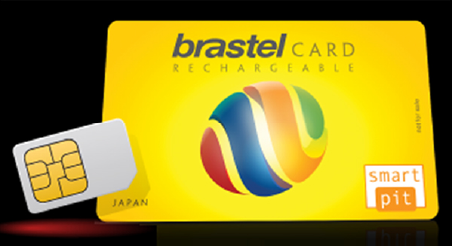 データ量をリチャージできます。 The Brastel Card allows you to place calls by using its dedicated app. 詳細はブラステルのwebサイトでご確認ください。 ※Get your own 050 number for free to receive calls.